I don’t always watch Fox News, but when I do it’s in a drunken stupor. Whenever I need a good laugh I turn on the conservative network. Never in the morning, because that’s too much to handle before my first cup of coffee. Never at night either, as that’s not what I want to be thinking about as I go to bed. Also never for more than thirty consecutive minutes, as that becomes simply overwhelming. But for those thirty glorious minutes in the afternoon, Fox News hits the spot. There’s something to be said for over-the-top, completely ridiculous television. I understand the need for this type of programming – and more importantly the audience it attracts. I also understand logical arguments when I hear them; I don’t often hear these on Fox News. Needless to say, I don’t schedule thirty minutes of my day to be intellectually stimulated. Rather, this blocked off period is for pure amusement. These days that amusement, and rightly so, is centered around Obamacare. With seemingly every second of broadcasting dedicated to that, when something comes up that isn’t directly related it catches your attention. And that something happened in a big way last week. It was just a line. It wasn’t even off topic. But it was a doozy: Obamacare is the Rob Ford of policy. When it was said didn’t happen to fall into my thirty minute daily allotment of Fox News time, so I didn’t have the pleasure of hearing it. But when my friend told me about it I couldn’t stop laughing – mostly because the Rob Ford circus had made reference on Fox News. Being from Canada, we’re not used to having our news be considered as real news. But then I saw it covered on CBS. Then on ABC. And then CNN had a live interview with a Toronto Star reporter on its prime time show. I started reading about it on the Huffington Post and other major online outlets including The Onion – and The Onion only makes fun of relevant things. I’m also not used to taking much interest in what’s going on in Toronto. I suppose being gone for over three years can have that effect. But when the mayor of Toronto is the topic for the opening ten minutes of The Daily Show, well, it must be a big deal, right? I still haven’t decided if I care. 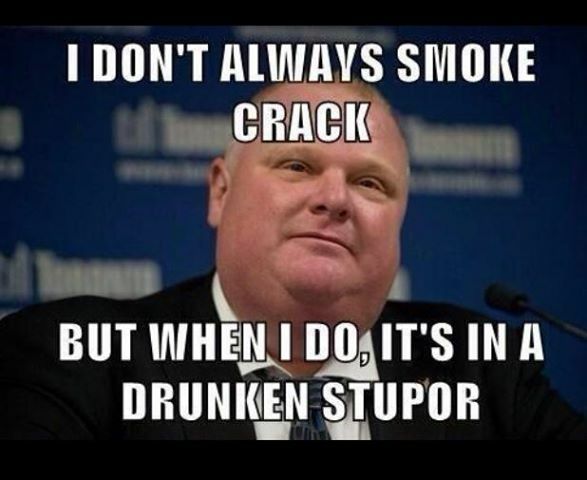 Not because I think the mayor of the fourth largest city in North America should be allowed to smoke crack and be drunk “on the Danforth.” Nor because I think he represents a great symbol for the city of Toronto and, in turn, Canada – because that’s how the U.S. media views it. I suppose I’m not sure if I care because I’m not sure if I should care. When voted into office (qualification: I didn’t vote for him) those who loved him did so in great part for that reason. They liked that he wasn’t politically correct. They liked that he said what was on his mind. I suppose they liked that he seemed just like one of the guys. Now that it turns out he’s just like one of the frat guys, people have changed their tune. I’m also not sure if I should care because the mayor of Toronto is also an almost purely symbolic position. With only one vote on city council, the Canadian mayoral system is a far cry from the power mayors have south of the border. So, from a political perspective, his apparent spring break lifestyle shouldn’t hurt the city like bad decisions can in U.S. cities. Is he tarnishing Toronto’s image outside the GTA? I’m not even sure of that. Everyone knows about it, but I haven’t met or heard from someone who has something other than a neutral opinion on the matter. It’s funny. It’s outrageous. It’s even unbelievable. But it’s gotten to the point (hasn’t it?) where it’s so outrageous that you can’t be upset about it. It’s now crossed into the “you can’t make this stuff up” category. While he’s surely tarnishing himself – and his family – I’m not so sure about the city. With that said, I’m not in Toronto and that allows me to step away from it more easily. It would be interesting to see if I were constantly surrounded by it, if I would grow to loathe it much like I have the saturation of Obamacare coverage. I’ve realized I don’t have an opinion of Rob Ford – and I never really have. I find this story amusing and comical, though from a distance. But much like Fox News, I would guess that more than thirty minutes a day would be overkill. So you are usually in a drunken stupor in the afternoon?